Be all prepared before you join the celebration in your locality this year. Well, don’t forget that gifts are the most important part of any celebration. Such gatherings are also the best way to show your creativity to the neighbors. 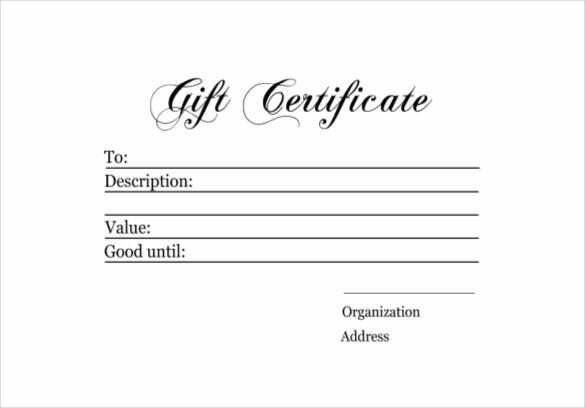 Try to gift all your friends some well planned homemade gift certificates and be the belle of the ball. 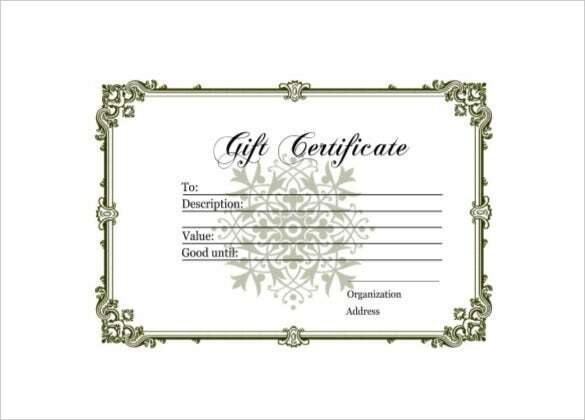 You may Like Blank Gift Certificate Templates To make your job easier we have a huge collection of uniquely designed homemade samples of Gift Certificate Templates. These are all easily downloadable templates and can be saved in any of the forms. 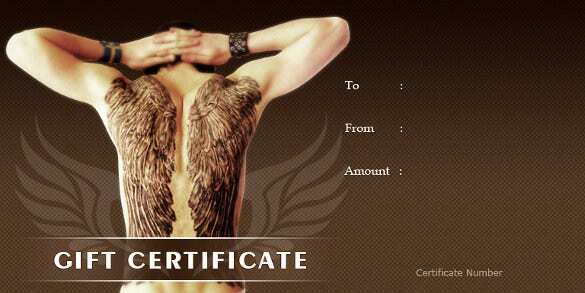 Prepare unique gift certificates in exclusive formats and enjoy the night. 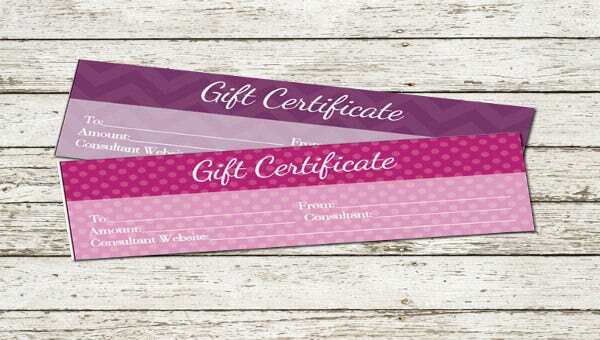 123certificates.com | If you are on the lookout of a simple gift certificate without much elaboration, this gift certificate here is the apt one to echo the DIY homemade spirit. The absence of extra embellishment is compensated by the simple homely warmth you have all over the certificate. It can be used for birthdays or your business gifts. 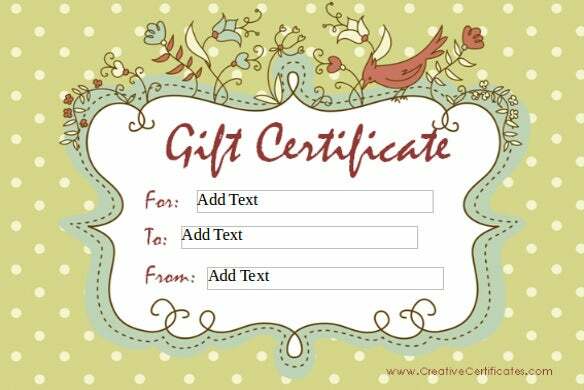 creativecertificates.com | The polka dotted background paints a pretty retro picture which is both classy & beautiful. The ornate frame housing the information about the gift certificate takes you further to the old world charm. 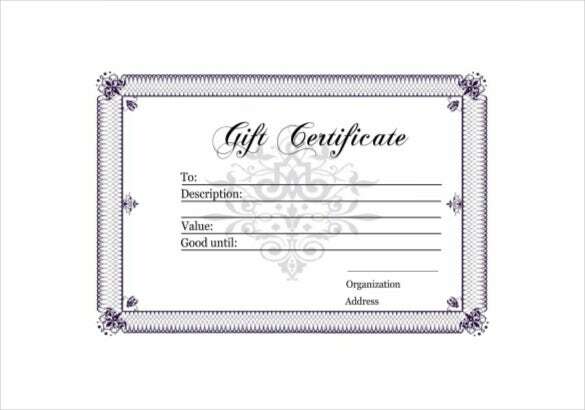 You can use it for birthdays, holiday gifts or any gift service that want to promote on behalf of your company. 123certificates.com | The light neon green background makes a funky statement without getting overboard with embellishments- that perfectly retain the homemade feel. 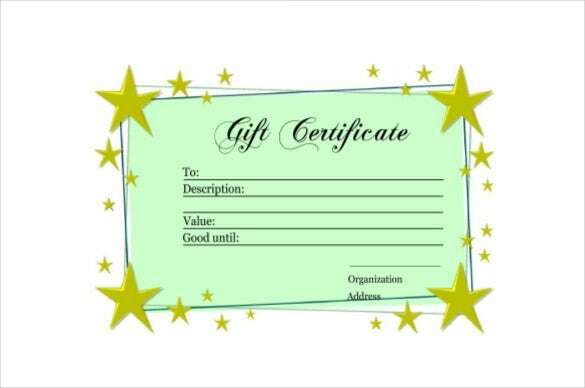 The golden stars at the borders and the sides render the desired dose of glamour to the gift certificate. It would be great for happy occasions like birthdays or Christmas. 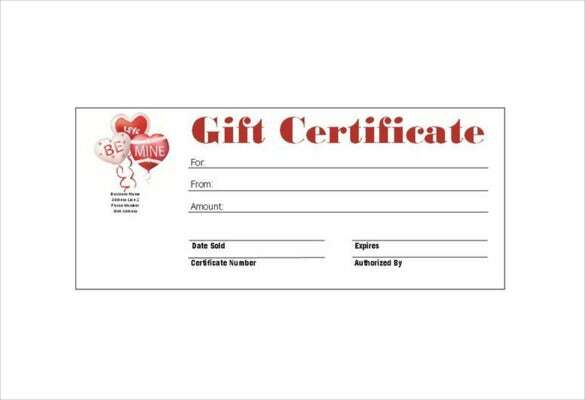 If you are looking for a lovely gift certificate especially for the Valentine’s Day offers, this gift certificate here would be a nice option for you. The heart-shaped balloons flying up in the sky speak of ardent love, setting the right romantic tone for the certificate. It’s simple yet stylish.